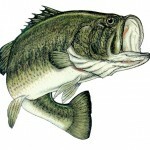 Membership is open to men and women at least 16 years old, who just love to fish for bass! “I pray that I may live to fish until my dying day, and when the Lord takes me in his great landing net, that I be judged big enough to keep”. 2018 Angler of the Year!